‘It’s less a reflection on them than it is on us. It wasn’t that they [Telefónica and Camper] had a great night, it’s that we had a tough one,’ Tom Addis. Now we’re getting to the tough part of this race. I’m not talking about 35 knot headwinds, six-meter swells, or soaking wet living conditions. I’m not talking about sleepless days, exhaustive malnutrition, sunburn or frostbite. I’m talking about getting close to a finish line, getting within 1000 miles of a destination you’ve been dreaming about for weeks. It puts everything else to shame. 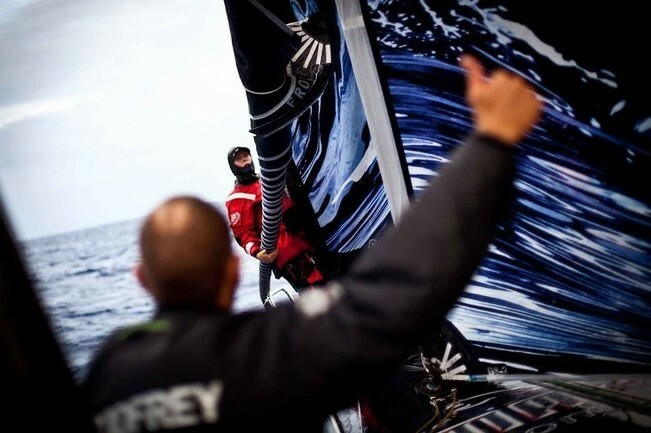 There’s something about the final few days of a leg that slow time down the way no other Volvo Ocean Race cruelty can. And in some instances such as this one, it can prove painfully difficult. Nobody would have predicted such a long and arduous road north to get south, and to add insult to injury – we left Sanya a day late. So instead of arriving tomorrow, the originally targeted Auckland arrival, we’re looking at another three days at sea and an expected ETA sometime on the 11th of March (our first day of leg five Southern Ocean practice is scheduled for the 14th). Part of what makes this race so appealing is the travel. But circling the globe with your family, friends, and teammates means little if you don’t have the time to enjoy it with them. And two days ‘off’ in New Zealand is not exactly what my parents had in mind when they happily organized a trip to see a place that nobody in our family has ever had the opportunity to go. Everyone has a story like that… Brad, who lives in New Zealand, doesn’t think he’ll have enough time to go home because he – like others – will be working from the shore base to fix what needs fixing. Even though we find ourselves in the midst of an extremely close race – a race for a podium position – it’s the human elements that can still reign supreme. That’s a good sign… we love what we do, but it’s not always everything to everyone. Auckland, thanks for your patience – we’ll see you soon!